A Dallas Tudor cottage infuses a New World home with Old World charm by bringing the outdoors in with rich elements. You don’t have to grow up on a ranch in a fourth-generation ranch family to embrace the earthy look, but Patricia Edwards did, and she does. Her gorgeous home in Hollywood Heights in Dallas, Texas, infuses an old 1941 Tudor cottage with the earthiness of European style. The Hollywood Heights neighborhood is a modern historical relic, featuring houses constructed as early as the 1920s. With its large collection of Tudor-style cottages, the neighborhood achieved Conservation District status in 1989, meaning that all old property must be left intact. 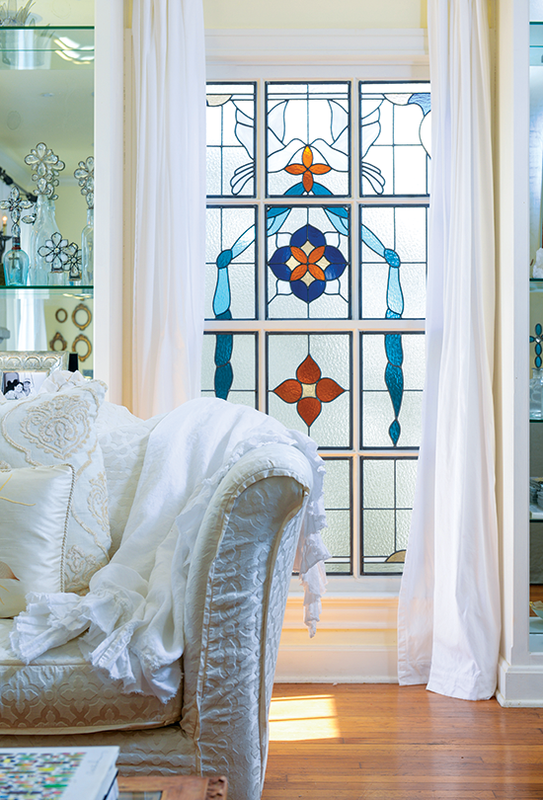 Patricia designed the stained-glass windows and cabinet in this distinctly “Patricia” living room. “It was important to keep the shelves subtle and understated,” she explains. “Once I put that stained glass in, everything had to be toned down a bit.” Crowning the softer shelves is a shadowbox full of real butterfly samples from the Texas Discovery Gardens. Patricia, a designer, artist and photographer, loved the Tudor cottage, the first home she has owned, from the time she moved in. As a designer, her philosophy is to bring the exterior in. So she designed the interior based on the stone exterior, which featured a pineapple from the house’s original construction—a European symbol for welcoming, with origins in Columbus’ travel. Following this motif, Patricia opted to carry the hospitality, and Old World culture, into the home. From the Swedish gray of the kitchen island to the 19th-century French veneer backsplash, the house exudes European warmth. European style “is a little bit earthy,” Patricia says. “I think that to embrace a European feel, you need to incorporate Old World with modern.” That means styling with wood and stone whenever possible, and making every effort to bring the outdoors in. “I like planting herb gardens and cutting herbs for my guests,” Patricia says. Patricia also chooses fresh, natural materials for textiles. “It’s important to have textiles that are made from things that are from the earth,” she says. 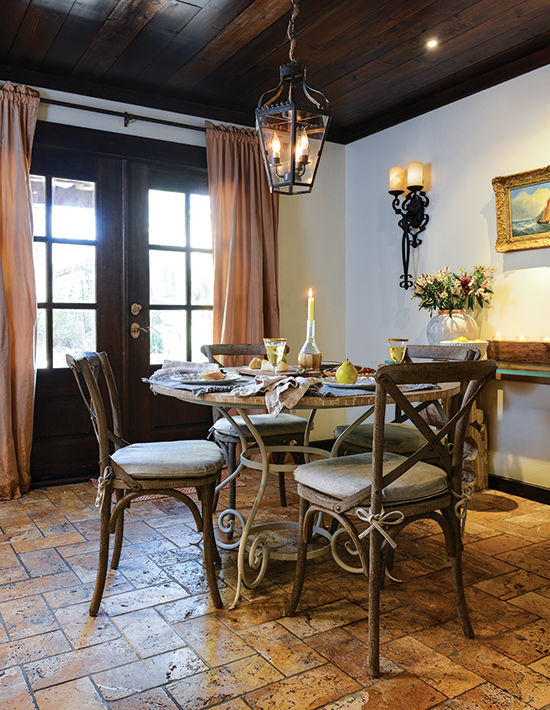 An early Renaissance-style light fixture overhangs the romantic table setting, complete with candlelight. While the simple decorations contribute to the Old World feel, the curly table legs add refreshing charm. The combination of table, napkins and chairs makes for an earthy setup, perfect for a picnic. 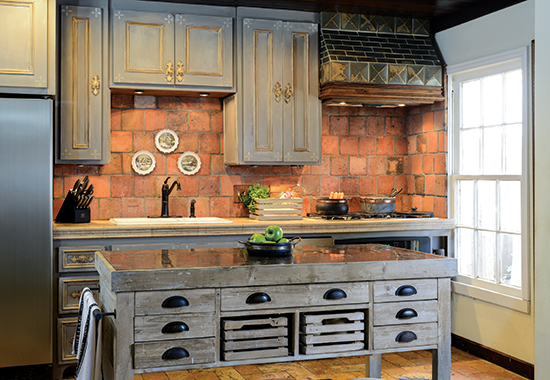 The kitchen borrows stylistic elements from several different European countries, with the Swedish gray kitchen island and a 19th-century French veneer backsplash, creating “a French marketplace feel.” The stove is an antique, and the flooring, found throughout the house, is 19th-century Italian limestone. Patricia prefers linen and cotton fabrics, and recommends mixing and matching for an inexpensive, but authentic European look. 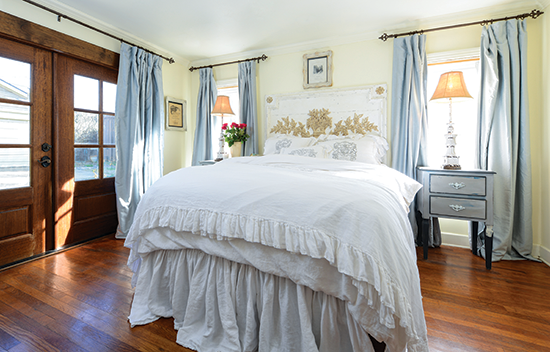 “I’ve been known to mix my handmade bedding with items from less expensive places,” she says. That way, you get a great look at a lower price. Another tip for styling on a dime? Combine old and new in your furniture choices. You can pick out a charming dresser, for instance, that looks antique (even if it really isn’t). Then, add some true antique feature. 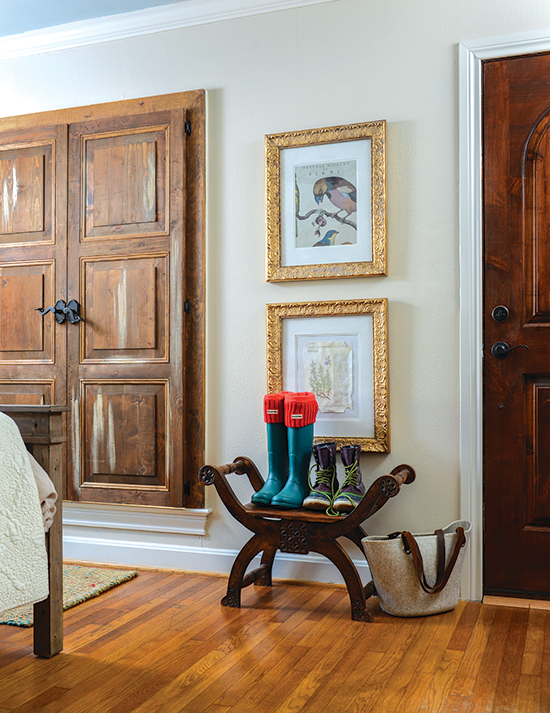 “Find an inexpensive piece,” she says, “and put an expensive knob on it.” You can find an antique doorknob from the 1800s on eBay and pair it with a simple stand from World Market. Voila! Now the whole item looks like it’s from the 1800s. 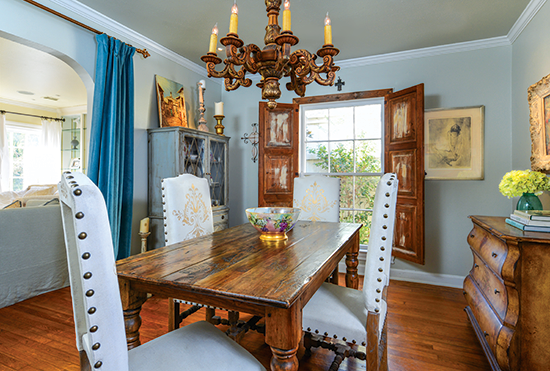 Subtle and understated, the hanging chandelier is a treasure, which Patricia found at an estate sale. Hand-carved, the bees’ wax chandelier is a 19th-century antique and the star of the dining room. The white chairs surrounding the table create a crisp contrast with the dark wood furnishings, and their design suggests European nobility. The quaint tablescape seems to have come right from a 19th-century French picnic. 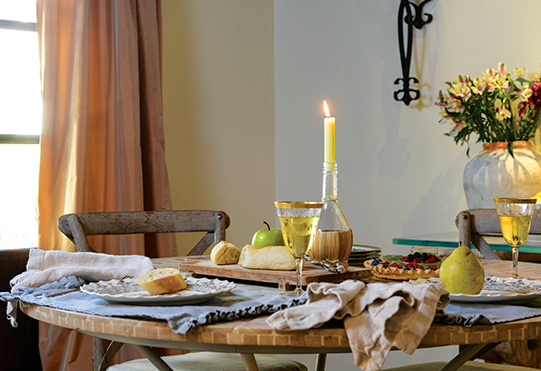 Fresh bread, cheese and fruit promise nourishment to the hungry wanderer, while the glass of wine and candleholder welcome a romantic atmosphere. Cloth napkins and wooden chairs are perfect, simple touches for this delightful setting. 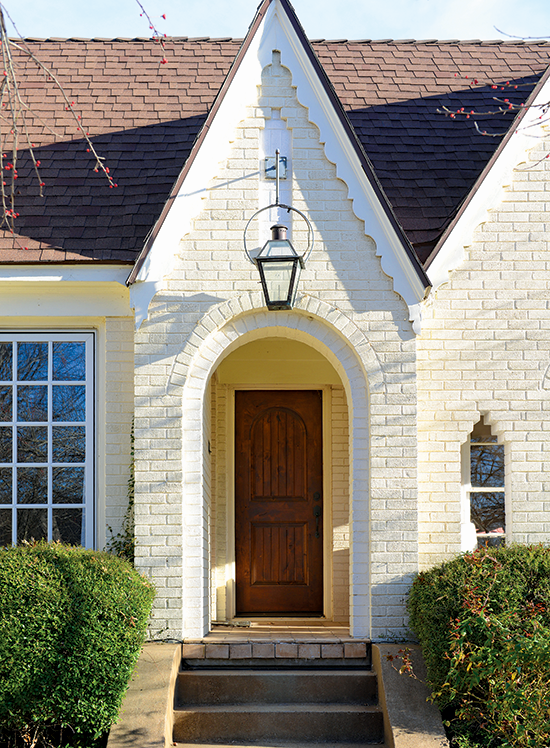 Antiques are an essential component of Old World décor, but too many antiques can run the risk of making a room feel heavy, so it’s important to use antiques wisely. Heir to her grandmother’s impressive antiques collection, Patricia brings in antiques like salt: just a dash here or there, and in moderation. “I am working my grandmother’s antiques collection into the house slowly,” Patricia says, “so it doesn’t look so old.” To create European style in your cottage, you should amass your antiques and flea-market finds over time, like Patricia. In addition to her grandmother’s antiques, she’s garnered her own collection of décor-to-be from estate sales and antiques shows. Part of Patricia’s creativity is her ability to reimagine new uses for a decorative element. 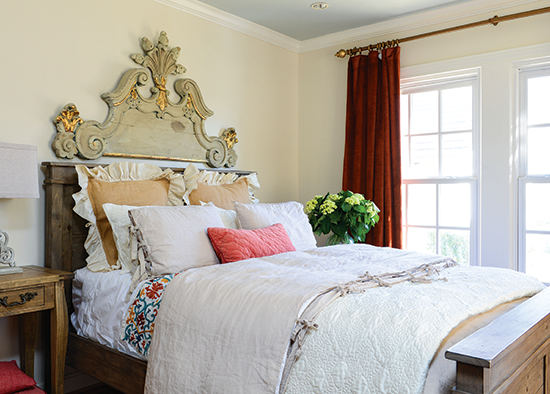 The headboard here was a flea-market find that is a replica of a piece above a fireplace in a castle in France. 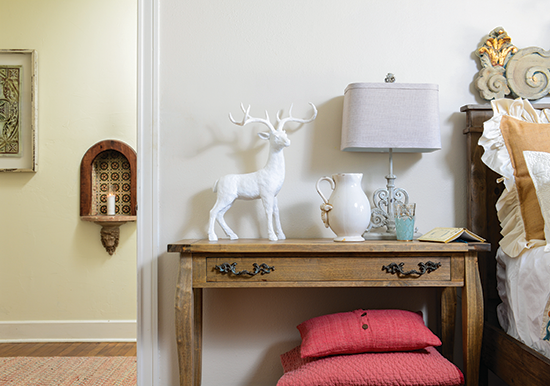 Rather than use it over a mantel, Patricia turned it into the crowning piece for this guest room. Patricia creates Old World art in her Tudor cottage by using pages from old illustrated books. You can create your own using her simple method of aging paper. • Pick your material. Pick your book pages, and carefully cut them out, making sure to give yourself as much space as you can for a centered design. • Give it a dip. Patricia ripped the corners of the paper to give it a more weathered, rugged look. Then she dipped the paper in tea. “Put tea bags in a bowl or on a cookie sheet,” she recommends. Leave the paper there to stain it. 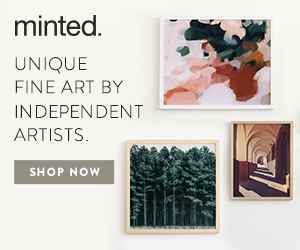 • Get framed. Once the paper is stained, allow it to dry. Then insert the artwork into the frame. Finish off your frame with gilding wax, and make it a treasure. As an artist, Patricia has been able to design a number of fascinating pieces for her own house. 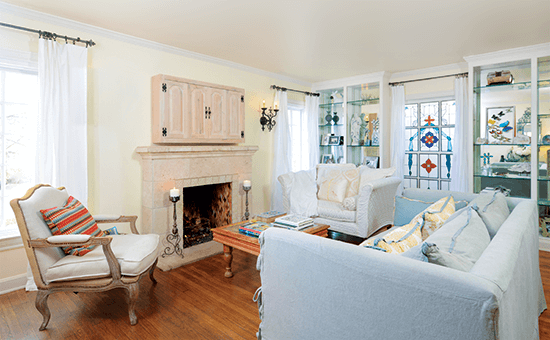 The living room features two prime examples: the stained glass windows and the television cabinet. Patricia combined her educational background as an artist and her expertise as a nature photographer into the stained glass pattern. It’s an ode to the outdoors, with a bird design. She also designed the wooden television cabinet above the hearth. Following her French-style motif, she chose to construct the cabinet from French hardware, which works with the iron candle sconces beneath and adjacent. Patricia also designed her own kitchen cabinets. Patricia picked up the Bolognese wooden bench at an estate sale, and it functions as an impromptu shoe rack. Above the bench is a DIY project Patricia completed with repurposed paper from an herb book. Beside the bed, an assortment of rose-colored pillows lounge underneath the console table. Atop the table, a stately deer and a pristine white pitcher find their home alongside a lamp, an arrangement consisting mostly of whites. In the hall, the antique phone jack now serves as a small shelf space. The charming guest room features double doors, which open out to the backyard, admitting the sound of running water from the fish pond. The large bed spotlights a fascinating headboard: a replica from a Bordeaux palace. 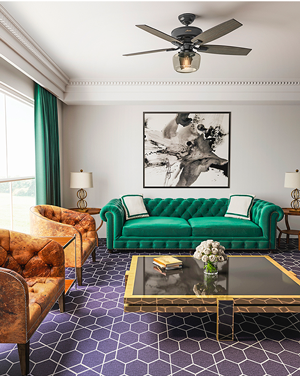 On either side of the bed, side tables and lamps create symmetry, enhancing the room’s aesthetic appeal. Patricia’s gorgeous sofa wears a beautiful slipcover, a utilitarian choice for the owner of two dogs. Warm light streams in through the stained-glass window, which Patricia designed herself, accentuating the brightness of sofa, cloth, cushions and drapes. Understated glass bottles with geometric toppers add a delicate background detail. 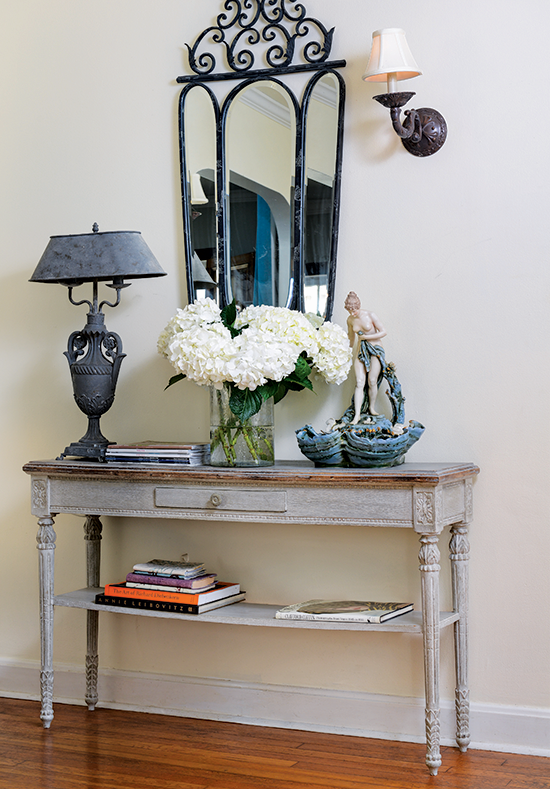 Iron frames the tri-paneled mirror above the console table. “I like iron, and you don’t have to be a millionaire to own it. Check out Lamps Plus or overstock.com,” Patricia says. “Keep an eye out for flat, matte metal.” Complementing the old-fashioned appeal of the iron, a cherub sculpture crowns the table. 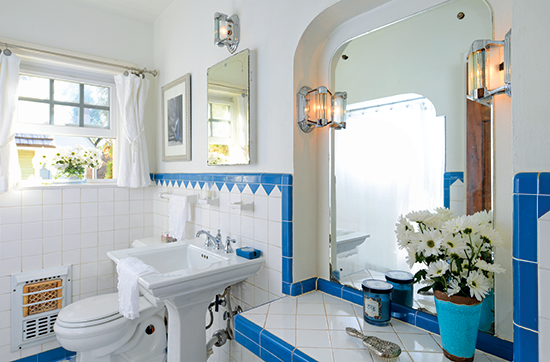 As this bathroom shows, blue is a fresh color that stands the test of time. “The bathroom has never been touched since 1941,” Patricia says. Fresh flowers offer bright décor, while an antique hairbrush, which belonged to Patricia’s grandmother furthers the Tudor cottage vibe. 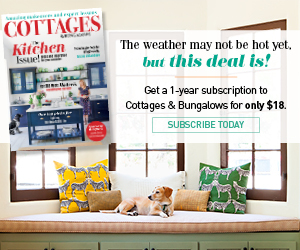 Need more Tudor cottage inspiration? How about this post for tips on creating an elegant garden perfect for a Tudor.